They spend up to $3,000 a year pampering their "fur babies" with special food, day care, grooming, medical care and insurance. Millennials delaying or forgoing having children are opening their hearts — and wallets — to spoil another kind of baby: the four-legged, wet-nosed kind. These young pet parents shower their dogs with financial affection and can spend up to $3,000 a year on high-end dog food, doggy day care, pet insurance and medical expenses for their fur babies. That eagerness to spend is boosting Long Island makers of organic dog food and natural dog treats, such as a Greenport baker of handmade "canine confections," a Hauppauge manufacturer of "slow-cooked, small-batch" dog kibble and a Huntington veterinarian who produces "human-grade" canned food for dogs. Dr. Geoffrey Broderick, the Huntington vet, once ate his Cornucopia brand dog food on TV's "Shark Tank" in an unsuccessful attempt to procure an investment from the show's panel of investors. "I don't make pet food," he said in an interview. "I make human food for pets." The spending is also benefiting the owners of local companies that provide dog services. Millennials — the 23-to-38 age group also known as Generation Y — spend $67 billion a year on their dogs, according to a 2018 survey by Nebraska financial services company TD Ameritrade. The survey found that millennial dog owners spend an average $1,285 a year on them. That generation has surpassed baby boomers as the primary dog-owning demographic: 38 percent of canines are now owned by millennials, compared with 26 percent owned by boomers, according to the American Pet Product Association, an industry trade group in Stamford, Connecticut, with a membership of 1,300 manufacturers. "The pet industry continues to be driven by the humanization of pets. However, millennials, in particular, are taking the humanization of their pets to the next level," said Bob Vetere, CEO of the APPA. Millennials "take their pets to the vet more, make sure they're feeding them only the best and healthiest food possible, buy vitamins and supplements for them, and go as far as choosing restaurants and hotels based on how dog-friendly they are." While cats are also spoiled, their owners, on average, spend about $400 less a year on their pets than dog owners. “Cats are by nature more independent and a lot more low-maintenance than dogs,” Vetere said. “So you will find that there are more opportunities to sell to a dog parent." Greenport resident Kelly Franké, 32, is a part-time artist and a full-time dog mama. Franké said her Thumper, half toy poodle, half shih tzu, is "like my actual baby." 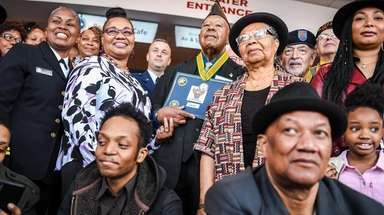 "I was just finishing grad school and had this need to kind of take care of someone," Franké said. "But I knew I wasn't in a place to have a kid, not yet at least." It was then that she brought home a 3-pound, gray-and-white ball of fur. "He was 8 weeks old," she said. "That was eight years ago, and we've been attached at the hip ever since." Franké, who likes to carry Thumper on her hip "like a child" and says she takes him with her "almost everywhere," pays $116 a month for a subscription for food delivered to her by mail from The Farmer's Dog, a Brooklyn-based company that sells human-grade doggy dishes made with beef and lentils, turkey and parsnips, and a string of other natural ingredients. 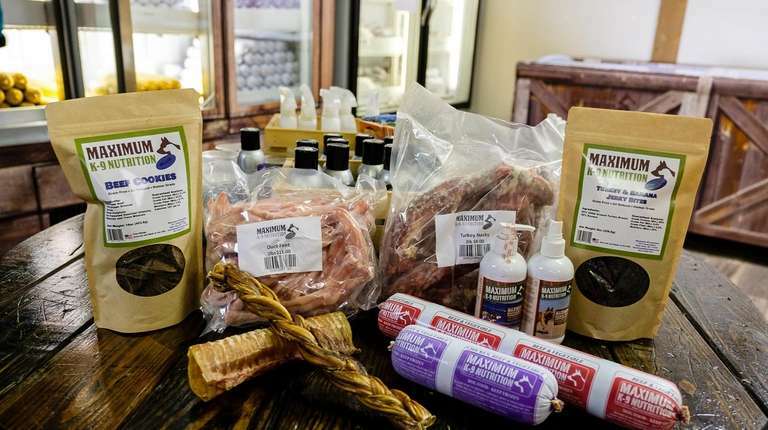 At Harbor Pet, a Greenport Village pet store, grooming center and dog bakery, Franké spends an additional $50 monthly on "healthy, all-natural" bones and cookies for Thumper. The treats, which come in a range of shapes like fried eggs and bacon strips, hearts and stars, and sailboats and crabs, are made by hand daily by Harbor Pet co-owner Kimberly Loper, a self-taught baker who began crafting the salt- and sugar-free concoctions for her own dogs in her home kitchen in 2010. "At first I just wanted my dogs, Tank and Trooper, to eat healthier," Loper said of her mastiff and black lab. "One had allergies and the other had cancer, so I started baking for them and giving out packages of treats to all my friends for their dogs. Some of the dogs were mainly meat eaters while others liked sweeter treats, so I made more and different kinds." She then started selling the confections — bones, cookies and "canine cannolis" — at farmers' markets. And what started as a bare-bones operation soon became a bona fide business: Loper called her seven-flavor line of all-natural handmade dog treats Life is Grruff. 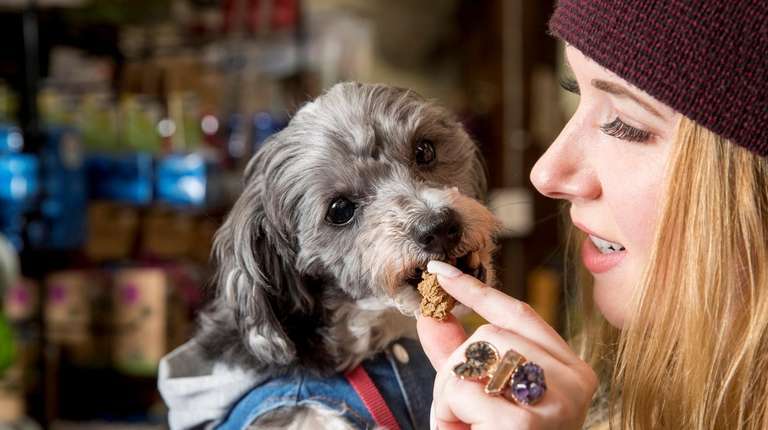 In 2014 Loper, who also bakes grain-free, yogurt-frosted birthday cakes for dogs, bought Harbor Pet, equipping an area of the store as its in-house bakery — a now popular haunt of the area's millennials like Franké who frequent the shop with their dogs and who she says represent 50 percent of her business. "Millennials don't see their dogs as animals, they see them as family," Loper said. "And that's why they'll go the extra mile to help them live longer." Franké says she doesn't mind the higher price tags at specialty stores like Loper's and prefers to buy Thumper's toys and treats there because she trusts the goods won't be "harmful, processed or mass-produced." For Amityville resident Michelle Blum, a licensed nutritionist who founded and operates counseling company Nutrish Mish, a healthy diet has always been important. But the 30-year-old says when she became a "mom" to Reese, a 10-month-old, tan-colored shar pei-basset hound mix, several months ago, making sure the pup ate "as healthily" as Blum did quickly became a top priority. "I make sure all her food is human-grade and organic," Blum said. 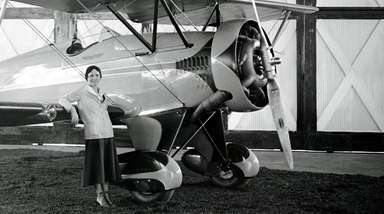 "I sometimes give her multivitamins and cook for her almost every day. I'm pretty sure Reese probably eats better than most humans do." 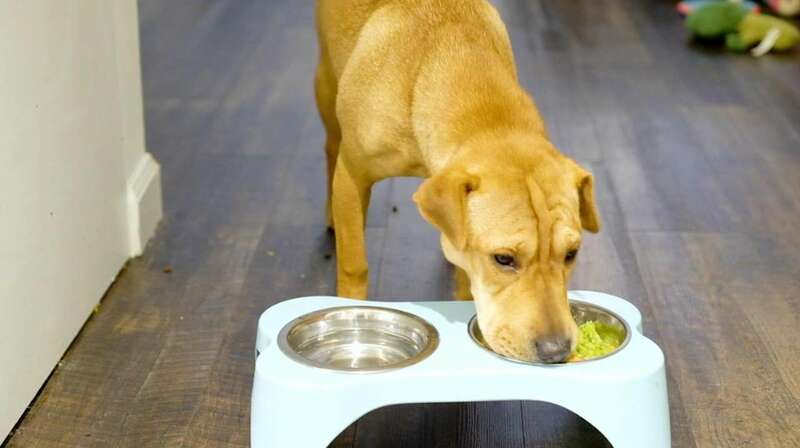 Blum, who said she spends about $100 a month to "feed Reese well," said she often cooks chicken blended with rice, pumpkin, butternut squash or vegetables like corn, peas and carrots, and sometimes mixes it with the dog's organic kibble. She also spends about $300 a month for day care services. Three mornings a week, Blum drops her off at a Hounds Town USA doggy day care location in Farmingdale. The Ronkonkoma-based company, which offers day care, boarding and pet spa services for dogs, has five locations on Long Island, with a sixth franchise scheduled to open in Garden City this month, and another planned in Hicksville in the spring. Teri Brogden, owner of the Hounds Town USA franchise in Deer Park, said millennials make up more than 40 percent of her clientele. "They follow us on social media to see pictures of their dogs or see what's going on for the day. They want to know which dogs their dogs are playing with and become friends with the other parents. Some even make dog-park play dates with each other. It's great." The day care facilities are equipped with indoor play areas that feature activity sets (think preschool fun) for the dogs to explore. Owners can pay a daily rate ranging from $31 to $34 or choose a monthly package costing about $450. Blum said she doesn't mind splurging on day care for her dog. "I would hate for her to be home alone all day while I'm at work," she said. "Plus, we think it's really important for her to socialize with other dogs." Blum and her fiance, Tim Francis, 28, got Reese for an anniversary, shortly before becoming engaged. The couple says taking care of her is "the best preparation" for starting their family. "I can't imagine having a kid will be that much different." Blum said. 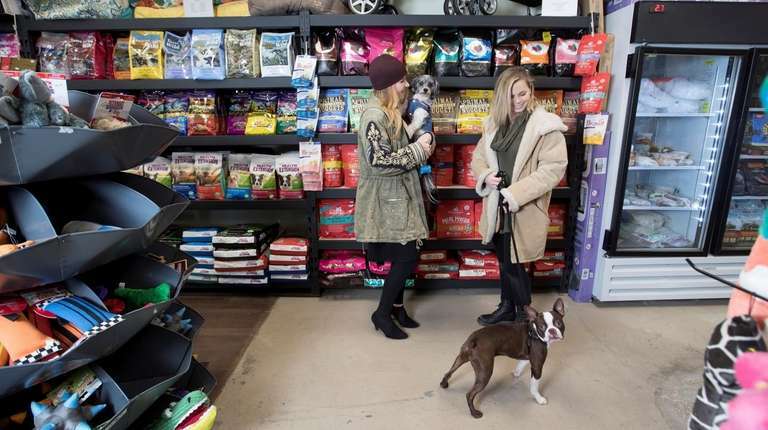 For Madison Fender, 29, a photographer who often drops off her 9-month-old Boston terrier, Carlos, at Dog Town, a dog day care in Southold, paying the $40 a day for his care is worth it, too. "I don't have to worry," she said. "I know Carlos is being well taken care of and is happy playing with his friends. I can freely focus on work." 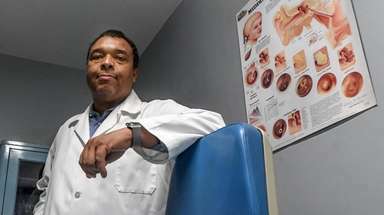 Broderick, the Huntington veterinarian, said he has long believed in the power of preventive nutrition to boost the health and life span of pets. He has been making Cornucopia canned pet food and dog supplements since 1969. "Every ingredient in the can is certified organic, all-natural, human-grade and GMO-free," he said. 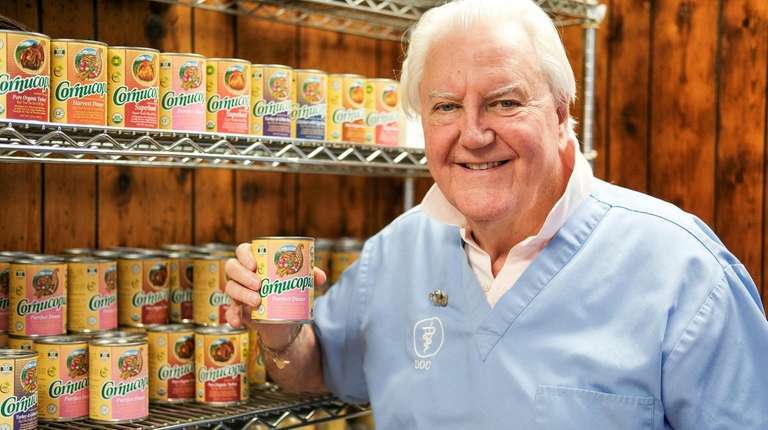 Cans of Cornucopia, which contain organic chicken, turkey, eggs, vegetables and wild salmon, are made in a manufacturing facility in the Midwest with recipes developed by Broderick, who travels there often to oversee and participate in operations — taste-testing every batch himself. His daughter, Michele Broderick, who works alongside her father at his animal clinic, says she still remembers watching him in the family's kitchen making the food that would go into glass jars that he'd gift to patients. "People were ecstatic with the results and started asking him for more and more food for their pets," said Michele Broderick. "And it just became overwhelming, so that's how Cornucopia came to be." Sales for the business, which sells a case of 12 cans for $69.99 on its website, have grown steadily, Geoffrey Broderick said. Joseph Secreti, a longtime dog trainer who owns Maximum K-9 Service, a pet shop, grooming center and training facility in Deer Park, says a generation of younger clients is turning to raw dog food — consisting mainly of uncooked meat, edible bones and organs — to improve their pets' health. Secreti, who also developed Maximum K-9 Nutrition, a line of gluten-free, no-sugar, chicken, duck and beef raw dog food blends, sold in a sausage-like casing, said he’s been feeding dogs raw food since the early '90s. “Only now has it become a trend,” he said. 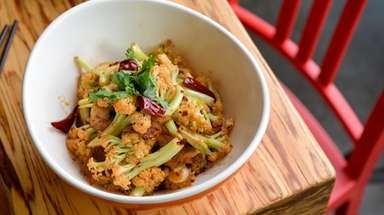 Because of its messy, bloody consistency, Secreti says, raw food that includes a variety of animal parts is off-putting to some. “It’s also a lot more expensive than your average bag of kibble." A 15-case pack of Maximum K-9 Nutrition raw blends sells for $83 on the company’s website. Holistic Health Extension, a family-owned, third-generation business in Deer Park, has its natural pet food manufactured in a facility upstate, said Brad Gruber, president. 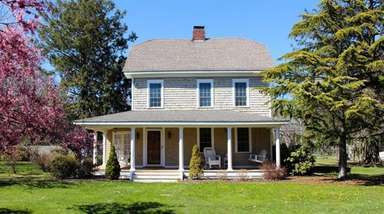 The food is made from proprietary recipes, mostly created by Gruber’s wife’s grandfather, who started the business from his home basement in Dix Hills in 1963. The business, which has 18 full-time employees, recently obtained approval for more than $300,000 in tax breaks from the Suffolk County Industrial Development Agency to support an $8 million move to Hauppauge. The new building, which is three times larger than the company's current facility, will allow it to "double down" on distribution operations and continue its expansion. “Our product is a niche, noncommercial, cooked-slow, small-batch product,” Gruber said, adding that Holistic Health is carried by more than 100 retailers. 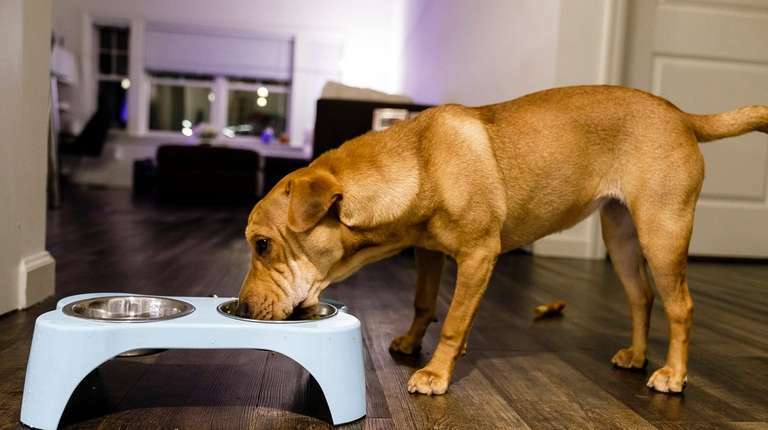 Holistic Health Extension, Gruber said, removes the mystery over what ingredients go into the pet food it sells by allowing pet parents to trace the origin of each ingredient on the company's website. Pet parents, he said, "want pet foods that are as good as, or superior to, their own and are comfortable spending money on their pets." "I rather spend the extra money and be sure he's safe and is eating healthily," she said. "I feel extra responsible for what I give him and what I feed him. I'm his mommy."